When combined with Peer or Sceptre Hot Cupboards the over shelves form a highly practical kitchen servery or pass. The flexibility of options available allow a kitchen specifiers exact requirements to be met. The drawings attached illustrate the range however we are able to vary shelf heights and configurations upon request. 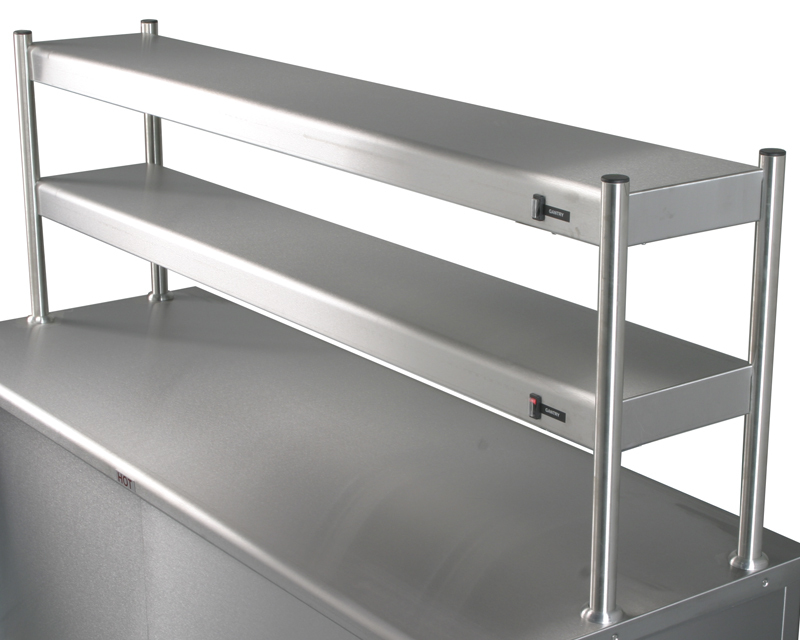 305mm wide heavy duty stainless steel shelves securely fixed to hot cupboard top. Integral wired to MCB within Hot cupboard. 300 Watt operator changeable quartz heat lamps with protective guards as standard. Option of rocker, dimmer or timer switch to gantry light. Tab grabbers. Sneeze screens. Fluorescent lamps. Victor Jamaican counter units can be finished to three sides in almost any design style. We can apply images, logo's, fonts and unique illustrations to suit your requirements.